I purchased my very first tactical folder during my Freshman year of college in 1992. That knife was a Spyderco Edura. Since that time, I have always been a fan of Spyderco knives. They were pioneers in that they were the first to incorporate a pocket clip into a knife design, deeply influencing the concept of the modern tactical folder as we know it today. Butch Vallotton is a custom knifemaker and tinkerer who is probably best known for his innovative method of converting a manual knife into an automatic. Butch and Spyderco teamed up a few years ago to offer a collaboration known as the Spyderco Vallotton Sub-Hilt Folder model C149G. This was an excellent move on Spyderco’s part, because the result was amazing. The C149G is a heavy-stock folder (6.2 ounces) with a thick 0.156” (4mm) modified tanto-style blade. The blade has a hollow grind on the cutting edge and a convex grind at the tip. This clamshell-shaped grind, known as a Hamaguri or Appleseed Grind, was very popular in designs by the late Bob Lum (the knifemaker who first introduced the modern tanto-style knife) and brings a distinct Japanese flare to the blade design. The blade length of the C149G is 3.75 inches, and the length of the handle is 5 inches, resulting in a knife that is just under 9 inches in total length—8.687 inches to be exact. Based on those numbers, it may appear as though some length was lost somewhere—exactly .063 inches—but this is due to the angle of the handle near the ricasso. The blade is made from Crucible Steel Company’s CPM S30V stainless, a proprietary powdered steel formulated specifically for cutlery. S30V is considered to be one of the best knife steels on the market. 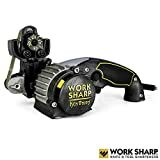 It is a very hard steel, so make sure you have a good diamond sharpener if you plan on touching up the edge. Of course, it will be a while before you need to re-sharpen it. 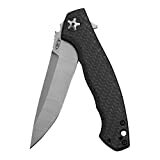 The C149G has a lightly contoured handle with black G10 handle scales. The highly-polished G10 scales have a beautiful, almost carbon-fiber look to them. The fitted stainless steel bolsters add a bold contrast to the black scales, resulting in a handle that has the aesthetic appeal of a custom folder. There are four mounting options for the pocket clip. The knife can be configured to be carried in either a tip up or tip down configuration with the clip on either the right or left side. While this option makes the knife extremely versatile and customizable to the user, the mounting holes on the bolster do detract a bit from an otherwise flawless handle. The clip itself is stainless steel with a nicely polished black finish and the Spyderco logo laser engraved into the metal. This Vallotton design pays homage to the Big Bear sub-hilt fighting knife designed by knife maker Bob Loveless. A comparison reveals that even the handle shape was heavily influence by the Big Bear. Since most of us here are knife nuts and like to concern ourselves with the minute details, I will go ahead and point out that, in the traditional sense of word, a folding knife does not actually have a hilt. A hilt actually refers to the entire handle of a sword or dagger. English is a derivative language, however, and knifemakers have historically modified the use of terms for lack of better descriptions, so I can see how calling this knife a “sub-hilt folder” is quite appropriate under the circumstances. This knife is pretty comfortable in the hand, though it does not offer anywhere near the level of retention or ergonomics as its namesake. The thumb hole has some fine jimping on the back portion and doubles as a thumb ramp when the blade is open, but the “sub-hilt” offers little more than a finger grove, most of which is obscured by the liner lock. All in all, the handle is very aesthetically pleasing, but nothing to get overly excited about in terms of handling. The C149G features Spyderco’s round thumb hole in addition to an ambidextrous thumb stud. The thumb stud doubles as a stop pin, in place of a locking bar, to prevent the blade from rotating beyond its lockup position. The combination of the two blade deployment options makes for a very positive single-handed deployment. I have found that the thumb stud serves well as a roadblock for the thumb to prevent it from slipping out of the thumb hole. The stainless steel Michael Walker LinerLock™ is very robust. The beefy liners on this knife are about as thick as the blades of some of the folders in my collection. This beefy lock combined with the thick blade offers one substantial lockup. I do not expect this knife to close without permission under anything but the most extreme adverse conditions coupled with sheer bad luck. This knife is not for the weak or faint of heart. It is a hefty 6.2 ounces, so if you are not a strong swimmer, then I do not recommend that you jump into the water with this knife in your pocket, even though it is stainless steel. I have been packing my Sub-Hilt Folder around for a little over three years, and I have affectionately referred to it as my “folding fixed-blade” because it is such a stout folder. It remains to be the smoothest opening knife in my collection, as well as the easiest one to open under stress. 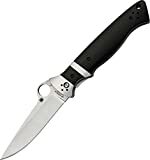 The Spyderco Thumb Hole is in my opinion one of the best one-handed opening systems on the market, and the addition of the ambidextrous thumb stud only increases its reliability. Although it is made in Taiwan, you would never believe it if it was not stamped on the blade. This knife has all the qualities of a handmade custom folder. This Italian-style, thick stock folder with its Japanese inspired blade design, à la Bob Lum, and its Loveless Big Bear flare, is not only an amalgamation of international blade culture, but a tribute to a couple of the greatest knife makers in American history. I do not know if that was what Vallotton and Spyderco intended when they began this project, but that is definitely what they accomplished. I recommend purchasing the Vallotton at Amazon or BladeHQ. Please consider that purchasing anything through any of the links on this website helps support BladeReviews.com, and keeps the site going. As always, any and all support is greatly appreciated. Thank you very much.